David Selby, editor of a great publication called The Chelmsford City Historian has kindly given us permission to post this piece about violence by Ipswich Town fans at a third round match of the FA Cup in 1973. It was first published in issue 10 (Winter 2012/13). All photos supplied by the Essex Chronicle. Used by kind permission. 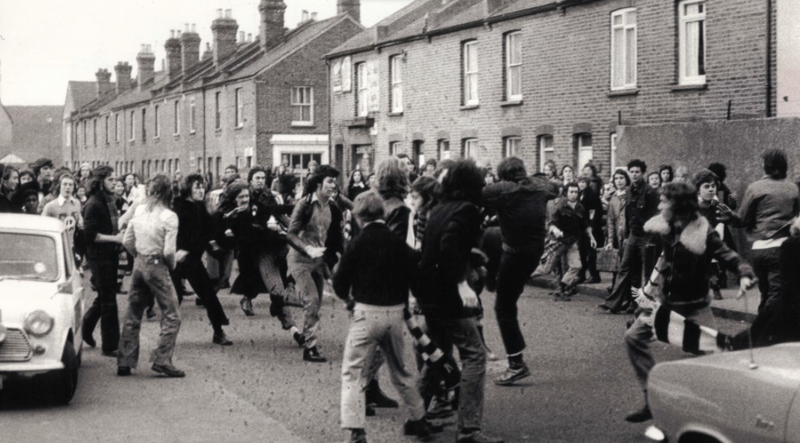 The 1970’s was a particularly bad time for football violence wise, and unfortunately the ‘disease’ did not escape New Writtle Steet. Not on a regular basis of course, but from time to time trouble did occur. When City met Colchester United in the F.A. Cup in January 1968 a crowd of 16,403 was present but there was little or no trouble. In January 1973 City were drawn at home to Ipswich Town in the 3rd Round of the same competition and although the crowd was smaller, 15,557 on this occasion, the ugly side of football reared its ugly head as the pictures on these pages indicate. The Central Park turnstiles were still open when this game took place but the trouble was limited, at least pre match, to the New Writtle Street entrances. 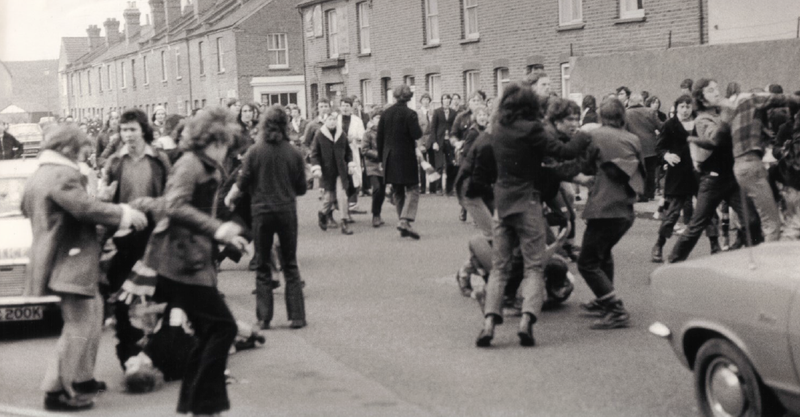 In the top picture we can see that the Police had dogs with them to help quell any trouble but the bottom picture shows the fighting in full flow with pitched battles between Chelmsford and Ipswich supporters. Unfortunately there were victims as the middle picture indicated with one of the supporters on the floor overlooked by a police officer. We have published these pictures not to glamourise the violence of the time but to show how much progress has been made over the years and that recent big games at Melbourne Park have shown that visitors to the ground can do so in a safe and friendly environment. The picture above shows visiting supporters from Ipswich outside The Bird In Hand Public House blocking the path of a car as it tries to travel along New Writtle Street. 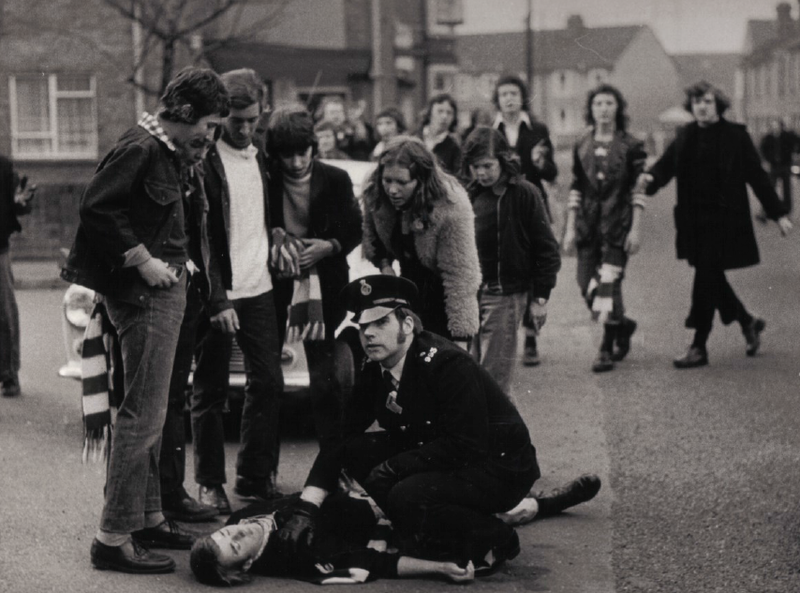 Whilst in the picture below a police officer attends to a supporter who has obviously been hurt. 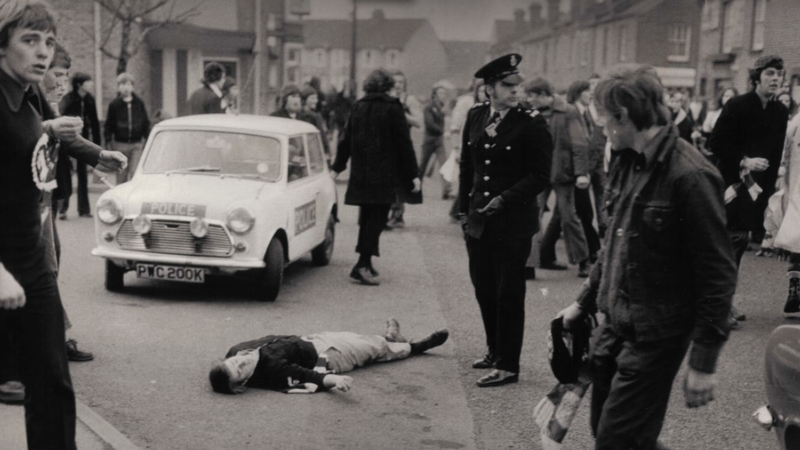 Unfortunately the violence was not restricted to outside the ground and when supporters from both clubs appeared in court on Thursday 1st February 1973 the whole story became clear. A string of fines were imposed on several supporters not only from Chelmsford and Ipswich but also from Colchester whilst fighting at the railway station resulted in an Ipswich supporter being convicted whilst a Chelmsford supporter had the charge against him dismissed. There had been trouble at the Woolworth’s store in the town and 18 Ipswich supporters who had been allegedly involved in the trouble had their cases adjourned until February 23rd. When these cases eventually came to Court their story was told. One set of supporters went into the High Street and caused £700, almost £6,000 in today’s money, worth of damage, mainly in Woolworth’s whilst others went on to Springfield Road. The two groups then joined up together and went on to Victoria Road where they threw bricks at shop windows and forced the public off the pavement. Some women were forced to pick up their children and move on to the road to avoid the mob. In view of the number of people charged and the complexities involved the case was adjourned again until Wednesday 21st March 1973. Sadly cases were also heard at the Juvenile court with several minors charged with various offences. The trouble between the two sets of supporters obviously lingered because when the sides met again in a pre season friendly in August 1976 there was plenty of trouble on that occasion too. This picture shows the fighting in full flow whilst the picture below shows a supporter being ejected from the ground before the game has even begun! 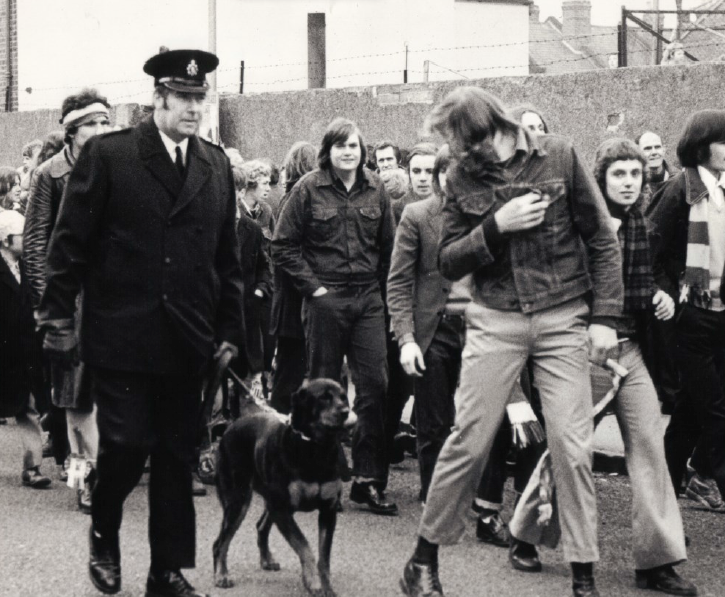 There was trouble in the ground and at the bus and railway stations too with numerous arrests on both sides.